I am willing to bet most people have never heard of paleotempestology before. I hadn’t heard of it before I took a marine geology course. In a course I am taking this semester, we decided to reexamine the topic because a lot of individual studies are debatable. So, if the title of this post didn’t already give it away, what exactly is paleotempestology? Paleotempestology is the study of past storms using the geologic record to identify deposits left by storms. Personally, I think this field is pretty awesome and it is a fairly new, up and coming field of geology. The term paleotempestology was first coined by Kerry Emanuel, who is basically a hurricane expert. Since then, paleotempestology has taken off and there have been many studies investigating what geologic proxies we can use to identify storms. There are a few proxies that are of geologic interest: beach ridges, storm scarps, and washover deposits (that we closely examined in class), but there are other proxies like lake deposits, corals, and tree rings. I would like to point out that while these are great proxies, scientists have to interpret these records with caution because each proxy has its limitations. If you have ever been to the East coast, you have probably seen or driven near a beach ridge system. Beach ridge systems are long shore-parallel ridges with swales (low points of muddy sediment sometimes with marsh grasses) between the ridges. These systems generally occur when sea level is falling. As the water recedes, with enough sediment and space, the beach is able to move seaward, or prograde. Generally, progradational systems are really good at preserving the geologic record because you are depositing sediment instead of eroding. Erosional systems destroy the geologic record. This is a Google Earth image of Pine Knoll Shores, NC. The beach ridge system is outlined in blue. Individual ridges are outlined in red. I did not outline all ridges. Google Earth V 7.3.2.5491 (February 19, 2017). Pine Knoll Shores, NC. 18S 333168 m E 3840953 m N. Terra Metrics 2018. So the real question is: how do these beach-ridge systems preserve storm history? I have an answer. Storms create berms on the beach. If you don’t know what a berm is, not to worry, I have provided a picture below. During subsequent storms, the berm continues to build up and migrate landward. At some point, the beach berm is cut off from storm influence and the cycle repeats itself. Now, there is a caveat, scientists aren’t exactly sure if these berms are a product of a single storm, or of multiple events. The height of the berm also creates some uncertainty. Depending on when storms hit during the tidal cycle, where your study site is in relation to the storm path, and some other factors, water levels can fluctuate dramatically. So, the berm height only provides a minimum estimate of storm water levels. Storm water levels could be higher, but researchers are only confident that the water must’ve reached that elevation. This is an picture of a berm on Shackleford Banks, NC. Some berms aren’t quite as scarp-like, but they can be dramatic features on the beach between the intertidal zone and the backshore. All of this information is great, but age dating the beach ridges is important to determine where in geologic history you are. Timing is important for lots of reasons, like determining climate states. Each dating technique is different and requires a set of assumptions and provides you with some form of error associated with a date. Dates are usually reported as a year, like 1435 ± some error like 50 years. So the absolute date falls somewhere between 1385 and 1485. Age dating can be difficult because with all dating techniques material selection is incredibly important. For example, with radiocarbon dating, you want to choose material that is produced in situ. Plants take in carbon during photosynthesis. As long as this active exchange with the atmosphere is occurring you will get a modern date. Once the plant dies, or is buried you stop the active exchange, and the carbon begins to decay. This is when your carbon clock begins. So, if you were age dating marsh material, you would ideally want to date a leaf or stem of an old marsh plant. You wouldn’t want to date a piece of wood you found because the tree that the wood came from could have been transported to the marsh and have died long before your marsh did. This would give you a date that is much older than your marsh. Radiocarbon dating beach ridges is difficult because you don’t have an abundance of vegetation to choose from, but you can use articulated shells. An articulated shell just means it is a shell with both halves still preserved. The shells don’t have to be stuck together, but the halves must match each other. It’s almost like connecting puzzle pieces. Another way to age date beach ridges is using optically stimulated luminescence (OSL). This technique measures the last time a quartz grain is exposed to light. There are some limitations with this method, like sediment composition. This can be a tricky method because you need the grains to stay in the dark when collecting and processing your samples. When you combine radiocarbon and OSL you can get pretty accurate age dates. When people use these methods to date beach ridge systems, they generally know they have good data if the oldest beach ridges are the farthest landward, and as you move seaward the ridges get younger. Generally if you get an inverted date, you know you did something wrong, like you didn’t choose good material to date. When you combine the stratigraphy with the age dating you can generally reconstruct storm records and determine periods of increased storminess. While beach ridges are usually well preserved there are some limitations with using them as paleo-storm indicators. For instance, even though progradational systems are not erosive you can have post depositional alteration of the beach ridge. Aeolian (wind) transport can modify the ridges. These ridges are also formed when there is a sea level fall, which means sea level is also modifying the ridge elevation. One way to account for this is to correct your data by subtracting sea level information out of the elevation. All of these limitations are just more reason why site selection is incredibly important. I know I mentioned three geologic proxies for paleotempestology, but this article is getting pretty long and kind of confusing, so let’s skip ahead to wash over deposits. 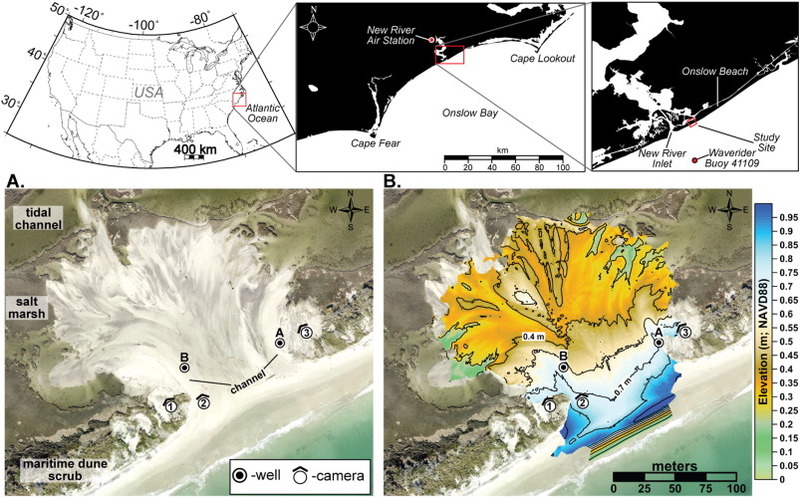 Washover deposits are formed during storms when water levels rise enough to breach the dunes and transport sediment across the barrier island. Washover fans generally occur when sea level is rising and barrier islands are narrow (transgressing). Transgressive barrier islands are islands that are moving landward as sea level rises and they tend to be more erosive environments which means less preservation potential. Washover fan on Onslow Beach, NC. Image from here. One difficulty with washover fans is once the dunes are breached in that area, it’s more likely that more frequent subsequent washover deposits will form, which may not be an indication of increased storminess, rather dunes are absent and unable to protect the back barrier. There is a strong dependence on water level and local topography. Because there is a breaching of dunes and large transport of sand landward, initial washover fans can be indicative of only the largest events. Like beach ridges, washover fans can be age dated using OSL or radiocarbon. If sand from the washover event blankets the marsh, you can radiocarbon date the underlying marsh vegetation. You can constrain the date of the washover fan by dating material above the washover fan. This method of dating above and below the deposit can really improve the resolution of your age range. Unlike beach ridges, initial washover deposits are associated with a single event, but subsequent deposits can form with additional storms. During Hurricane Fran, several dunes breached, producing washover deposits on Onslow beach, NC. Over time, some of those washover fans, like the Fran fan, recover by vegetation colonization and stabilizing dunes. One washover fan on onslow beach deposited during hurricane Irene. Dunes are not able to stabilize in front of the fan, so it remains active during spring tides and additional storm events. This is an awesome digital elevation model of the washover fan on Onslow beach that formed during hurricane Irene and remains active. VanDusen, B.M., Theuerkauf, E.J., Fegley, S.R., Rodriguez, A.B. (2016). Monitoring overwash using water-level loggers resolves frequent inundation and run-up events. Geomorphology, 254, 32-40. I personally find paleotempestology incredibly fascinating. With any new field, there are lots of criticisms and lots of uncertainty, but combining these studies validates these individual results. There is still a lot of research and future directions that need to be explored with these in order to reliably reconstruct storm records, but some scientists build their career around this discipline. It is not an easy field to work in particularly because storms are erosive events and they usually aren’t well preserved. It takes a lot of effort for these studies to be possible, and also knowledge of storms and depositional processes to determine adequate field sites. There is a really great geologic principle described by Charles Lyell called uniformitarianism that pretty much states the present is the key to the past (I definitely summarized this). What this principle is really trying to get at is the process that occur on Earth today have been operating through geologic time, so we can take our understanding of what happens today and apply it to what we see in the record. For paleotempestologists this principle is essential for their work. It is how they developed proxies for storm deposits and how they are able to validate their research. There is still a long way to go, but for now it seems as though the possibilities are endless in this field.